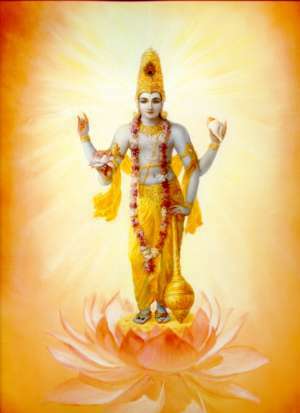 The use of Īśa (Lord)—a more personal name of the Supreme Being than Brahman, Ātman or Self, the names usually found in the Upanishads - constitutes one of its peculiarities. It forms the closing chapter of the Yajur-Veda, known as Śuklā (White). The Īśa-Vāsya Upanishad is that which gives Brahma-Vidyā or knowledge of the All-pervading Deity. ॐ पूर्णमदः पूर्णमिदं पूर्णात् पूर्णमुदच्यते . auṁ pūrṇamadaḥ pūrṇamidaṁ pūrṇāt pūrṇamudacyate . from the Invisible Whole comes forth the visible whole. yet the Whole remains unaltered. ॐ शांतिः शांतिः शांतिः ..
auṁ śāṁtiḥ śāṁtiḥ śāṁtiḥ ..
ॐ ईशा वास्यमिदँ सर्वं यत्किञ्च जगत्यां जगत् . तेन त्यक्तेन भुञ्जीथा मा गृधः कस्यस्विद्धनम् .. १..
auṁ īśā vāsyamidaɱ sarvaṁ yatkiñca jagatyāṁ jagat . tena tyaktena bhuñjīthā mā gṛdhaḥ kasyasviddhanam .. 1..
should be covered by the Lord. Having renounced (the unreal), enjoy (the Real). Do not covet the wealth of any man. कुर्वन्नेवेह कर्माणि जिजीविषेच्छतँ समाः . एवं त्वयि नान्यथेतोऽस्ति न कर्म लिप्यते नरे .. २..
kurvanneveha karmāṇi jijīviṣecchataɱ samāḥ . evaṁ tvayi nānyatheto'sti na karma lipyate nare .. 2..
one should live performing Karma (righteous deeds). Thus thou mayest live; there is no other way. By doing this, Karma (the fruits of thy actions) will not defile thee. असुर्या नाम ते लोका अन्धेन तमसाऽऽवृताः . ताँस्ते प्रेत्याभिगच्छन्ति ये के चात्महनो जनाः .. ३..
asuryā nāma te lokā andhena tamasā''vṛtāḥ . tāɱste pretyābhigacchanti ye ke cātmahano janāḥ .. 3..
अनेजदेकं मनसो जवीयो नैनद्देवा आप्नुवन्पूर्वमर्षत् . तद्धावतोऽन्यानत्येति तिष्ठत्तस्मिन्नपो मातरिश्वा दधाति .. ४..
anejadekaṁ manaso javīyo nainaddevā āpnuvanpūrvamarṣat . taddhāvato'nyānatyeti tiṣṭhattasminnapo mātariśvā dadhāti .. 4..
That One, though motionless, is swifter than the mind. The senses can never overtake It, for It ever goes before. Though immovable, It travels faster than those who run. By It the all-pervading air sustains all living beings. तदेजति तन्नैजति तद्दूरे तद्वन्तिके . तदन्तरस्य सर्वस्य तदु सर्वस्यास्य बाह्यतः .. ५..
tadejati tannaijati taddūre tadvantike . tadantarasya sarvasya tadu sarvasyāsya bāhyataḥ .. 5.. It moves and It moves not. It is far and also It is near. It is within and also It is without all this. सर्वभूतेषु चात्मानं ततो न विजुगुप्सते .. ६..
sarvabhūteṣu cātmānaṁ tato na vijugupsate .. 6..
he never turns away from It (the Self). तत्र को मोहः कः शोक एकत्वमनुपश्यतः .. ७..
tatra ko mohaḥ kaḥ śoka ekatvamanupaśyataḥ .. 7..
when he sees this oneness (everywhere)? र्याथातथ्यतोऽर्थान् व्यदधाच्छाश्वतीभ्यः समाभ्यः .. ८.. He has disposed all things duly for eternal years. अन्धं तमः प्रविशन्ति येऽविद्यामुपासते . ततो भूय इव ते तमो य उ विद्यायाँ रताः .. ९..
andhaṁ tamaḥ praviśanti ye'vidyāmupāsate . tato bhūya iva te tamo ya u vidyāyāɱ ratāḥ .. 9..
इति शुश्रुम धीराणां ये नस्तद्विचचक्षिरे .. १०..
iti śuśruma dhīrāṇāṁ ye nastadvicacakṣire .. 10..
By Vidyā one end is attained; by Avidya, another. Thus we have heard from the wise men who taught this. विद्यां चाविद्यां च यस्तद्वेदोभयँ सह . अविद्यया मृत्युं तीर्त्वा विद्ययाऽमृतमश्नुते .. ११..
vidyāṁ cāvidyāṁ ca yastadvedobhayaɱ saha . avidyayā mṛtyuṁ tīrtvā vidyayā'mṛtamaśnute .. 11..
crosses over death by Avidya and attains immortality through Vidyā. अन्धं तमः प्रविशन्ति येऽसम्भूतिमुपासते . ततो भूय इव ते तमो य उ सम्भूत्याँ रताः .. १२..
andhaṁ tamaḥ praviśanti ye'sambhūtimupāsate . tato bhūya iva te tamo ya u sambhūtyāɱ ratāḥ .. 12..
and they fall into greater darkness who worship the manifested. इति शुश्रुम धीराणां ये नस्तद्विचचक्षिरे .. १३..
iti śuśruma dhīrāṇāṁ ye nastadvicacakṣire .. 13..
by the worship of the manifested, another. Thus we have heard from the wise men who taught us this. सम्भूतिं च विनाशं च यस्तद्वेदोभयँ सह . विनाशेन मृत्युं तीर्त्वा सम्भूत्याऽमृतमश्नुते .. १४..
sambhūtiṁ ca vināśaṁ ca yastadvedobhayaɱ saha . vināśena mṛtyuṁ tīrtvā sambhūtyā'mṛtamaśnute .. 14..
and attains immortality through knowledge of the First Cause (Unmanifested). हिरण्मयेन पात्रेण सत्यस्यापिहितं मुखम् . तत्त्वं पूषन्नपावृणु सत्यधर्माय दृष्टये .. १५..
hiraṇmayena pātreṇa satyasyāpihitaṁ mukham . tattvaṁ pūṣannapāvṛṇu satyadharmāya dṛṣṭaye .. 15.. The face of Truth is hidden by a golden disk. O Pūshan (Effulgent Being)! Uncover (Thy face) that I, the worshipper of Truth, may behold Thee. व्यूह रश्मीन् समूह तेजः . योऽसावसौ पुरुषः सोऽहमस्मि .. १६..
vyūha raśmīn samūha tejaḥ . yo'sāvasau puruṣaḥ so'hamasmi .. 16..
pūṣan – O Pūṣan, O Nourisher; ekarṣe – eka-ṛṣe – the One (Principal, Supreme) Wisdom; yama – Punisher or Judge of all; sūrya – sun; Prājāpatya – Prajāpati, progenitor; vyūha – expand, spread; raśmīn – the rays; samūha – gather, in-draw, collect; tejaḥ - effulgence; yat – what; te – thy; rūpaṁ - form; kalyāṇatamaṁ - most auspicious; tat – that; te – (through) thy (grace); paśyāmi – I see, I (may, wish) to see; yaḥ —who; asau — in life; asau – that; puruṣaḥ — Personality; saḥ — he; aham — I; asmi — am. withdraw Thy rays and gather up Thy burning effulgence. Now through Thy Grace I behold Thy blessed and glorious form. The Purusha (Effulgent Being) who dwells within Thee, I am He. ॐ क्रतो स्मर कृतँ स्मर क्रतो स्मर कृतँ स्मर .. १७..
auṁ krato smara kṛtaɱ smara krato smara kṛtaɱ smara .. 17..
and let this body be burned to ashes. Om! O Lord, remember my deeds! O Lord, remember, remember my deeds! Remember! विश्वानि देव वयुनानि विद्वान् . भूयिष्ठां ते नमउक्तिं विधेम .. १८..
viśvāni deva vayunāni vidvān . bhūyiṣṭhāṁ te nama̮uktiṁ vidhema .. 18..
O Agni (Bright Being)! Lead us to blessedness by the good path. O Lord! Thou knowest all our deeds, remove all evil and delusion from us. To Thee we offer our prostrations and supplications again and again. ॐ पूर्णमदः पूर्णमिदं पूर्णात्पूर्णमुदच्यते . auṁ pūrṇamadaḥ pūrṇamidaṁ pūrṇātpūrṇamudacyate .